Vinyl Custom Printed Flooring – Grabbing the attention of a crowd at your expo booth doesn’t have to be difficult. You simply need a display that wows attendees. Your goal for exhibition marketing is to bring visitors to your booth that want to experience your product or your service. Adding a custom-made top-quality flooring such as Grafx helps to bring excitement to your trade show booth by . Ultimately, catching people’s eyes is what a good display aims to do. Whether for trade shows or even retail shops, stores or hotels, good flooring gives a professional appearance that improves the reputation and impression of a business. Custom graphic flooring also add comfort for both you, your team and your visitors. This anti-fatigue flooring is comfortable and durable for years to come. You want your customers to feel comfortable and to stay in your booth for as long as possible. Creating custom printed flooring for your event can add a different level of advertising for you. The professional appearance of your booth combined with a durable and strong product leads to an A-1 experience. GrafX comes in custom designs and sizes to suit the needs of every custom. Use high resolution high-quality graphics to customize your flooring. This slip resistant flooring has a laminate coating that protects its image to last for a long period of time. Invest in your event booth today with professional top-quality flooring. Best of all, it is easy to transport to and from events and is durable and strong meaning the investment is something you will be able to use for years to come. 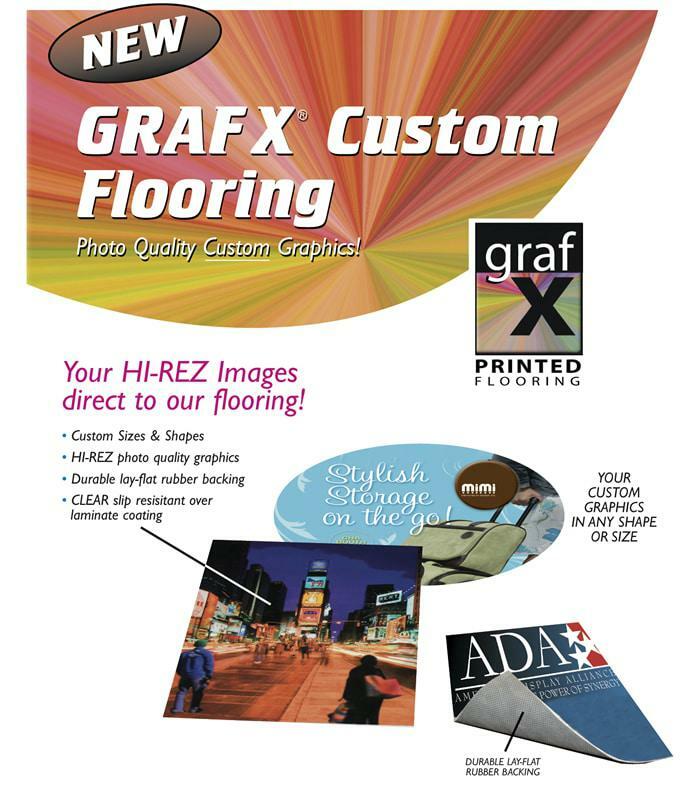 For more information on high-quality GrafX customflooring, contact our professional team at Capital Exhibits today!